Small Chocolate Embossed base with Gold Embossed Pinstripe lid with window are great boxes for candy and gift packaging. Sold in bulk packs of 24. Lid of box measures: 3-5/8x3-5/8x5/8". Window measures: 2-3/4x2-3/4". Boxes are made from 100% recycled boxboard and paper coverings; Green Way® Eco Friendly Packaging and Made in the USA. 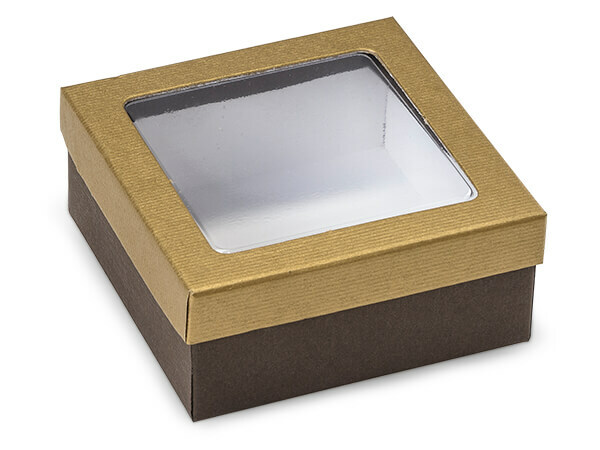 These gourmet candy boxes are high quality rigid boxes with an acetate window in the lid. Boxes are made of 100% recycled boxboard. Made in the USA.